It is that time of the year again, and even in the normally sunny and bright southern Mediterranean, the days are noticeably shorter and, more often than not, suitably wintry. Visitors to Gibraltar alighting at Gibraltar International Airport or disembarking at Gibraltar Harbour’s Cruise Terminal cannot fail to notice that current of excitement and anticipation in the air that Christmas is only a few, short weeks away. Already, tourists browsing Gibraltar’s Main Street shops will be immersed in the local Christmas shopping experience. The scents of spiced fruits hang in the air, Christmas carols can be heard in the music channels and shop assistants are vying with each other to help shoppers choose the best gifts for their loved ones, while also wearing jovial elf hats and gaudy sweaters! Traditional Christmas decorations – green fir trees swathed in glittering baubles – rub shoulders with more recent decorating trends such as rose gold and champagne coloured tinsel draped over white trees, or the more rustic charms of pine cones and bundles of cinnamon sticks bound in red velvet ribbons. And with Gibraltar’s strong cultural links to Spain, there are miniature figurines of all sorts with which each household can build up its own ‘Belen’, the traditional Nativity scene. And, having reached the end of November, those short evenings have at last been brightened with some festive cheer to liven up the shopping experience. A splendid display of lights has been set up along Gibraltar’s main shopping streets and the traffic roundabouts are also cheerfully decorated. The official ‘lighting up’ ceremony took place on “Black Friday” with eager shoppers, families with children as well as grandparents, aunts, cousins, all gathered in Sir John Mackintosh Square in front of City Hall to enjoy an evening of music, dance and entertainment, culminating in the big ‘switch on’. For the next few weeks, tourists arriving at Gibraltar will be able to enjoy sight-seeing tours around the Rock, taking in some of the most spectacular views of the Strait of Gibraltar as well as all the natural magnificence Gibraltar has to offer. Then they can browse some of the best, tax-free shopping in the area. High-end jewellery, designer fashion and top of the range electronics vie for attention with perfumery, fine wines and spirits and luxury chocolates, all ideal gifts that tourists can take home for that someone special. 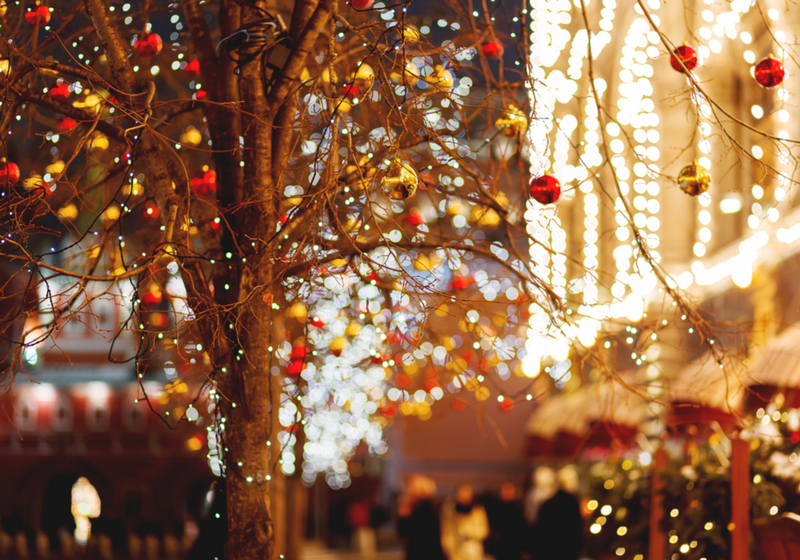 With a traditional, British-style Christmas – including a busy Christmas market complete with wooden stalls, local crafts and, joyfully, plenty of mulled wine – charming local touches, and the glow of Christmas lights warming up the earlier twilights, Gibraltar’s tourists can be sure to enjoy a Christmas treat or two. And look out for Santa!